Atman is extremely virtual which means something that is extremely ‘off-the-mass-shell’, not hugely confirming to Energy-momentum relationship. Manas is virtual, which means it is ‘off-the-mass-shell’, not confirming to Energy-momentum relationship. Manas are virtual particles that bind. Nara are real, the particles which confirm to energy-momentum relationship. The real photons travel at light speeds, possess energy, produce electromagnetic field (nasatyas) around them. They are the dawn of the Universal evolution. The dawn of Universal evolution that is talked about in Vedas is the photons decoupling to become the Cosmic Microwave Background. That was the dawn of Universal evolution which lead to nucleosynthesis, atomic elements, compounds and life as we see it now. Manushya are beings that have the virtual particle (manas) in them. All beings which have ‘manas’ the virtual particle inside them are manushya. For eg. 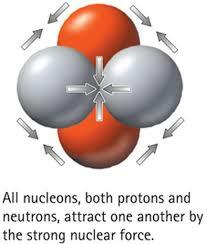 all atomic nucleus are manushya as they have virtual pions (manas) that bind nucleons. According to science strong force mediated is by gluons. Gluons are particles that mediate and as well as participate in strong interaction. Gluons in mesons and baryons also are ‘virtual’ in a way. But they not only mediate but also participate in the strong interaction (giving color to the quarks). Since they participate in the strong interaction (and not just mediate) they are not the ‘manas’. Hence baryons and mesons are ‘devas’ that immortal. But for eg. Virtual pions that mediate the residual strong force in an atomic nucleus are ‘manas’ as they don’t participate in the interaction. So such atomic nucleus (and all beings made of atomic nucleus) are manushya and mortal. How does Atman lead to Manushya..? That’s where Soma, the strong force comes in . Soma (Strong force) flows directly from the Atma (Extremely virtual)’s navel. Soma or strong force is ‘milked’ from the Atma’s navel says this sloka Rg Veda Mandala 9 Hymn 74. Soma evolves the ‘Manas’, the virtual and the Manushya, the real beings with ‘Manas’. Science says strong force is the first force to separate in the Universe. It leads to massless bosons (virtual), quarks and anti-quarks (real) and all other advance matter forms with 'manas'. This evolution of Atma the extremely virtual to Manas the virtual to Nara the real particles and then leading to Manushya, all the matter and beings with Manas happens when Soma (strong force) is filtered/purified in to pavamAna (residual strong force). This is the subject of Rg Veda Mandala 9 Hymn 74. Asvin is the electromagnetic field. Asvam are the electromagnetic frequencies. Zveta means white. Zvetam asvam are the frequencies of electromagnetic spectrum spread across the complete spectrum. These are ‘massless’ radiations of energy through massless photons (Apa) that travel at the maximum speed of light. Zvetam Rupam are white-colored particles that form out of the strong force. Quark-Antiquark pions and three quarked baryons are 'white' colored (neutral color charged). These neutral color charged matter appear from the Soma or strong force. Strong force creates them. Ga are the spinless goldstone bosons that correspond to the spontaneously broken internal symmetry generators. These are massless like photons or have little mass (in which case called pseudo goldstone bosons). But they move at lesser speeds than the photons. Hence they are said to be ‘cold’ or ‘himAya’. These massless goldstone bosons of the early Universe appear as spontaneous symmetry breakers. There are 100’s of these cattle or cows or goldstone bosons all through the universe that appear in the breaking of symmetry. Thus Asvam/Horse (frequencies of electromagnetic spectrum mediated by massless photons travelling at speed of light) and Go/cattle (massless bosons that travel at less than speed of light) dot the pre-dawn Universal landscape. Asvins are electromagnetic field mediated by virtual photons. The Electromagnetic field may get created between any configuration of charges. Soma is strong force. pavaMana is exactly equivalent to term ‘Residual strong force’. It is filtered strong force. Vrsakapi are those rudras or force fields that cause mass defect due to binding energy in the binding they cause. Vrsakapi Rudra is produced by Soma pavamAna or Asvins. When Vrsakapi Rudra is a result of Soma pavamAna (the filtered strong force), binding the protons and neutrons in an atomic nucleus, the exact equivalent term for Vrsakapi Rudra is “Nuclear force field’ (which is caused by residual strong force). Vrsakapi is inside the nucleus. When Vrsakapi Rudra is a result of Asvins (Electromagnetic field filled with virtual photons) binding the protons and electrons in an atom, the exact equivalent terms for Vrsakapi Rudra is “Electromagnetic interaction between proton and electron’. Asvins are electromagnetic field between any charges. It could be between ions, molecules, compounds and between protons and electrons also. Vrsakapi is inside an atom between nucleus and electron. Soma pavamAna means that is purified (or filtered) Soma. The Rg veda Mandala 9 Hymn 74 talks about how Soma gets ‘purified or filtered’ into pavamAna. That purification happens by the filtering of Soma through ‘Manas’. This pavamAna filtered by manas is what is drunk by Indra (baryons) to become nucleons, atomic elements and life as we see it now. Soma is Strong force. Science says Strong force or Strong interaction gets ‘filtered’ or ‘purified’’ into Nuclear force. This happens by ‘filtering’ of Strong force through virtual pions. This filtering of soma by the virtual pions causes the baryons like protons and neutrons to combine and form nucleus of atoms. The nucleo-synthesis leads to formation of Universe’s elements, compounds and all its life. This sloka says from the Atman, the extremely virtual, the Soma or strong force is continuously milked as immortal nectar. According to science strong force is the first force to have originated in the Universe. It is immortally present in the Universe. This sloka says Amzu are stalks or filaments filled with Soma. Amzu are filaments or stalks that are filled with Soma, the strong force. They are the gluons that mediate the strong force and also participate in strong interaction. According to this sloka, the amzu condenses into a Yaksa (Kuvera or dhanada) giving rising to streaming of beneficial real particles. Thus kuvera is known as wealth providers. Also that’s why Kuvera is described as always drunk with Soma (the strong force). According to science the gluons (what the sloka calls as amzu) condense into a color flux tube or gluon condensate matter. This color flux tube generates quarks and antiquarks, which are on-the-mass-shell and hence real. From these quarks and antiquarks, leptons come out. The entire universe is made of these quarks and leptons. According to the sloka and science, the Amzu or gluons cannot be detected normally. They are often seen as a stream of baryonic/mesonic (nara) particles. They are mostly virtual, in the sense, off-the-mass-shell in mesons and baryons. One can only see the beneficial real (nara) particles that stream from them. This sloka says these streaming of real particles happen in three regions or three generations. The streaming in the third generation/region only produce passionate offsprings which takes the Universe towards the dawn. According to science, the quarks and leptons are produced in three generations of families. Of these three family generations, only the third generation matter forms evolve further and dominate the Universe. This sloka says white-colored (neutral color charged) particles are created from Soma the strong force. In this casket of such particles ploughed by high energy gamma ray photons, 100's of symmetry breaking generators called 'Ga' or cows or goldstone bosons appear. These symmetry breakings lead to matter with 'manas' or virtual pionns. This is the story described in Rg Veda Mandala 9 Hymn 74. The pillar holding the dawn are the well stretched complete amzu moving around. Great discharge condenses yakSa, tending in common direction for wiser beings. The great discharge of gluons condenses to a yakSa (Color flux tube or gluon condensate matter or the Kuvera or Danada), giving rise to wiser beings. The Great mover of the photons containing soma (the amzu or yakSa) does well to (be) the sweet pasture for Aditi’s order.He who commands the morning light of strong/energetic photons lead/guide extending from hence consisting of Rc (verses or particles). The amzu/gluons (soma-stalk) silently/noiselessly/without expressing explicitly attach smoothly; They strain/filter the soma causes the matter with virtual particles to overflow from their skin. They give pregnancy undividedly by placing self near by which way offsprings and children are got. Innumerous streaming of those inexhaustible in third division/generation manifests passionate off-springs.The dawn placed downwards from four navels (four centers); the oblations carry the immortal oil/ghee (in this case the soma or strong force) that distills. The three regions are the three generations of matter. The third generation of matter manifests passionate offsprings. The dawn is placed downwards of the four navels.The four navels are the four fundamental forces (strong, weak, Higgs, electromagnetic). The oblations (quarks/antiquarks from the gluon flux tube) carry the soma or strong force as the ghee that burns them. The soma or strong force distils further in them. The Soma/strong force creates the white colored matter/neutral color charged matter (quark-anti quark pions three quarked baryons), when they wish to obtian/gain the Knowledge (of) ‘mana’ of beings. The pre-dawn lights of the proclamation of the dawn accompany the visible headless body (of white colored baryons and mesons) which keep increasing. The virtual pions (manas) of the matter (devayanta) filter the soma or strong force and send it out as pavamAna, the purified one. Intelligent atomic nucleus (with higher and higher number of nucleons) clean off the soma or strong force as they soak in soma as Indra (baryons) drink the pavaMana, the filtered strong force or residual strong force or nuclear force. Svar - vibrations (of light and sound) Vibrations of light is sky, sound is noise/music. Svar is also a horse (band of frequencies). BORN like a youngling he hath clamoured in the wood, when he, the Red, the Strong, would win the light of heaven. Amzu the gluons are described as the ‘pillars’ holding the dawn of the Universe. The pillar holding the dawn are the well stretched complete amzu moving around. Great discharge condenses yakSa, tending in common direction for wiser beings. The great discharge of gluons condenses to a yakSa (Color flux tube or gluon condensate matter or the Kuvera or Danada), giving rise to wiser beings. A far-extended pillar that supports the sky the Soma-stalk, filled full, moves itself every way. I translate ap-saras as mover of apa or mover of photons, as Apa are photons. I tranlsate vrsa Apam as energetic photons. Butter and milk are drawn from animated cloud; thence Amrta is produced, centre of sacrifice. The Soma-stalk hath roared, following with the wave: he swells with sap for man the skin which Gods enjoy. In the third region which distils a thousand streams, may the Exhaustless Ones descend with procreant power. The Soma (strong force) filtering asura do/create/assumes the white form (the white colored quark-antiquark pions, the white colored three quarked baryons) when wish to obtain/gain the Knowledge (of) ‘mana’ of beings. These 'pre-dawn lights' of the proclamation of dawn accompany the visible headless body (of white colored baryons and mesons) that keep increasing. The Soma/strong force creates the white colored (neutral color charged) matter (quark-antiquark pions, three quarked baryons), when they wish to obtian/gain the Knowledge (of) ‘mana’ of beings. The pre-dawn lights of the proclamation of the dawn accompany the visible headless body (of white colored baryons and mesons) which keep increasing. Soma (the strong force) creates the ‘white-colored’ particles (neutral color charged particles like mesons and baryons) that keep increasing with the pre-dawn lights of the proclamation of the dawn. Soma assumes white colour when he strives to gain: the bounteous Asura knows full many a precious boon. Yea, to the shining milk-anointed beaker, as to his goal, hath stepped the conquering Courser. Soma, thy juice when thou art blended with the streams, flows, Pavamana, through the long wool of the sheep.